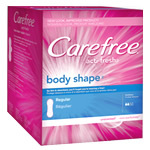 Receive a free sample of Carefree Acti-Fresh from Walmart. Please allow 6-8 weeks for delivery. Limit 1 per household. You can choose to print a coupon now or receive a sample & coupon in the mail.